Precise combination of comfort & elegance is put into this stretchable piece of clothing. Ankle length Jegging with composition of Cotton & Spandex (Lycra) gives great fit. Jeggings are the optimal solution when seeking comfort and style. It is the combination of jeans and leggings and the replacement for skinny jeans with a variety of solid color options and fabric. Unlike denim they contain more Lycra, so they are easy to slip on and move around in. it can be paired with anything from a tank to a tunic. 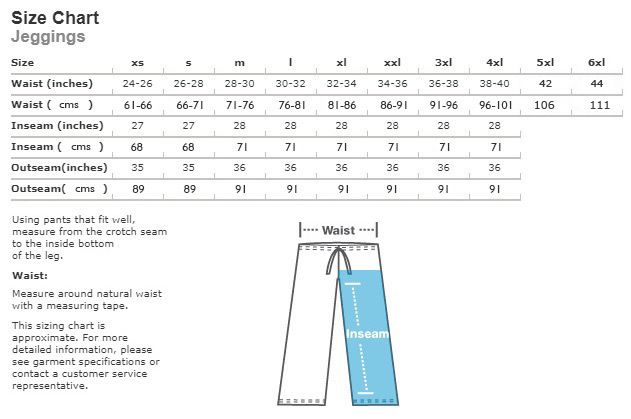 Sizes we are offering varies from XS to 4XL along with 5XL and 6XL, also we are having the option to customize for tall women’s / girls looking for jeggins / jeggings online.